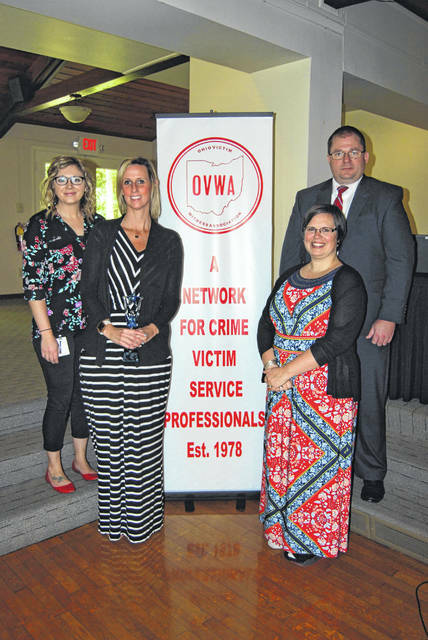 Director of Victim Services Trish Wright, middle left, poses with her staff at the Ohio Victim Witness Association luncheon last week. Pictured alongside Wright are Megan Powell (far left), Penny Bennett (middle right) and First Assistant Delaware County Prosecutor Kyle Rohrer (far right). Wright said she had no idea she had been nominated for the Advocate of the Year award until she got a call that she had won. Delaware County Victim Services Director Trish Wright was recently presented with the Advocate of the Year award from the Ohio Victim Witness Association. Wright said she did not know that Nora Flanagan at HelpLine of Delaware & Morrow Counties had nominated her for the award until two weeks ago when she got a phone call telling her that she’d won the award. Last week, Wright attended a luncheon and was presented the award. Wright said that she used to be a social worker in Columbus but lived in Delaware and grew tired of the commute, so she applied for a job a the Delaware County Victim Services unit, which assists victims of felony crimes and is starting point for 90 percent of civil protection orders filed in the county, Wright explained. Ten years later, Wright is the director of Victim Services. In her nomination of Wright, Flanagan praised the work Wright has done as director. Wright said she enjoys her work because in the late 1980s, she was the victim of a crime and did not have a victim services advocate to get help from. Wright said she lives in Delaware and wants to be a part of and help the community. Wright said the award didn’t just belong to her, but belongs to her staff, Megan Powell and Penny Bennett, as well.